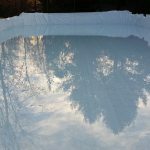 I am assuming that working with pond ice provides quite a few more challenges that are not encountered by the backyard rinks.........the size, the amount of water, thickness of the ice. I say this because, as I was shoveling off the pond again last week, I noticed something was not looking right. There was two nice cracks in the ice forming a "X" shape right through the center of the rink area. And where the "X" was, there was a really nice hump again centered in the middle. So you would skate up and then down a incline. It was a big enough hump, that no amount of flooding was going to make a big enough change. I have never encountered that before and I assume it was a result of the two cracks and the movement of the ice. It's things like that make you realize, you really are at the mercy of the pond hockey gods and you have to work with what they give ya. "I was never unhappy at the hockey rink"
I think they refer to those as 'pressure cracks'. I would suspect there might have been a quick fluctuation in the temperatures - warm and then a quick freeze that might have caused something like that, but then I'm just guessing.